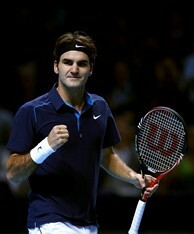 Roger Federer won his opening match at the 2011 ATP World Tour Finals. LONDON (AP) - An ailing Rafael Nadal toiled for nearly three hours before beating Mardy Fish 6-2, 3-6, 7-6 (3) at the ATP World Tour Finals on Sunday, while Roger Federer also needed three sets to win his opening match. Defending champion Federer began his quest for a record sixth title at the season-ending event by defeating Jo-Wilfried Tsonga of France 6-2, 2-6, 6-4. In a tense evening match at London's O2 Arena, Fish recovered from a nervous opening set in his debut at the tournament and saved two match points at 5-4 in the third set. Despite struggling with illness, Nadal was able to clinch it in the tiebreaker. Group A begins Monday with Andy Murray facing David Ferrer, and top-seeded Novak Djokovic against Tomas Berdych. By the time Nadal and Fish walked off court at gone 11:30 p.m. local time on the opening day of the tournament, many of the 17,000-strong crowd had already left to catch the last train home. The late match mirrored the early one between Federer and Tsonga. Federer and Nadal both dominated the opening set only to lose the momentum early in the second set. Tsonga wilted when serving to stay in the match at 5-4 in the decider, while several poorly hit forehands in the tiebreaker did Fish in. ``I didn't play a great tiebreaker. He did. That was pretty much the difference,'' said Fish, who ended the match with 35 winners to Nadal's 18. Federer and Nadal now will play each other for the 26th time, continuing their long rivalry Tuesday. Federer beat the Spaniard in last year's final, but has lost their three meetings in 2011. Nadal made Fish wait in his chair while he had his finger taped by the trainer after the warmup and the American made a nervous start as he dropped serve in the opening game. After dominated the opening set, Fish found his range on his forehand and, combining it with some deft volleys and delicate drop shots, the eighth-seeded Fish pushed the match into a decider. Nadal began to feel the heat. He dashed off for a bathroom break after taking a 2-0 lead and returned to drop serve as Fish ended the game with a perfectly judged half volley to break back. Sticking with his attacking game, Fish broke for a 3-2 lead, but was immediately broken at love to make it 3-3. Fish did what Tsonga earlier failed to manage by saving two match points at 5-4. Federer is on a 13-match winning streak following titles in Basel and Paris, where the No. 4-ranked Swiss beat Tsonga in straight sets in the final a week ago. The 16-time Grand Slam champion looked ready for another comfortable win when he took the first set in 21 minutes, but Tsonga broke early in the second. A closely fought third set ended when the pressure seemed to get to Tsonga. Trailing 5-4, he was broken at 15 and Federer chalked up his third straight win over the Frenchman since back-to-back losses at Wimbledon and Montreal. Federer has won at least 60 matches for nine straight years, and extended his career record over Tsonga to 7-3.